Beginning: 9 at night and still light is alright. Days are so sunny this week I'm walking to and from work along the Thames south bank, coffee in hand one way and riverside glass of vino the other (breathe and repeat). Middle: The brilliant diddywah (I know, I'm biased) has listed us alongside an inspired set of vego musical jewels (visit the post here). End: Chew's got me swooning over Nigel Slater and his Kitchen Diaries. Apart from the fact he knows food real good, the sweet enthusiasm, detailed disappointments and occasional lapses into culinary laziness as he documents a year in his beautifully photographed kitchen are just fine by us. I pay homage to Nige this evening by vegetarianising one of his dishes (no cabbages in sight). Preparation is simple on this light, sweet and tangy number as long as you have some roasting time up your sleeve. Red wine vinegar (I didn't have it, so used Orleans vinegar and red wine). 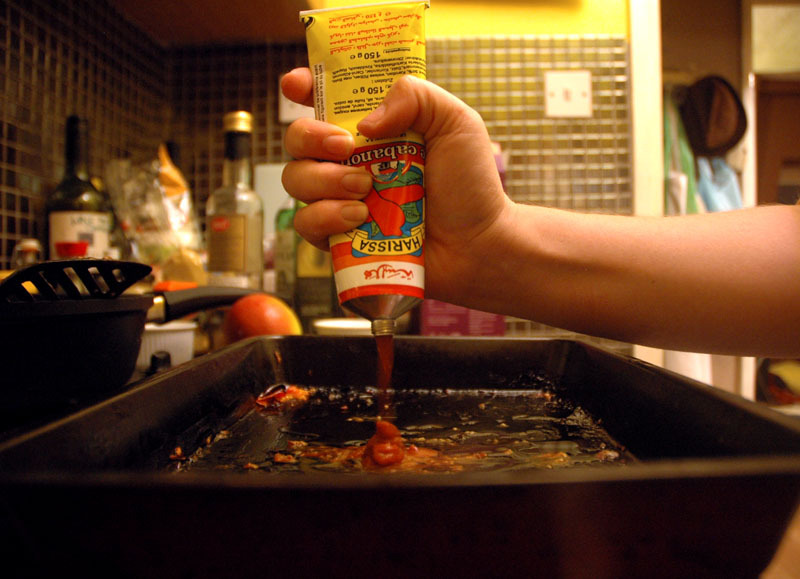 Harissa paste (from the tin, jar, tube or home made if you know how). A big handful of kalamata or other fresh olives (I get mine from Borough Olives). Preheat your oven to 200C (gas 6). Toss your aubergine and toms in an oven tray with the cumin, a big splash of red wine vinegar, pinches of salt and pepper and a generous amount of olive oil (he says 60ml but I have never measured olive oil in my life; coat 'em good, I say). Roast for an hour or, to quote the man himself, "until the aubergine is soft and golden brown, the tomatoes are caught slightly at the edges and the whole lot is fragrant, sizzling and juicy." Sigh. At about 40 minutes chuck in the olives so they warm through. 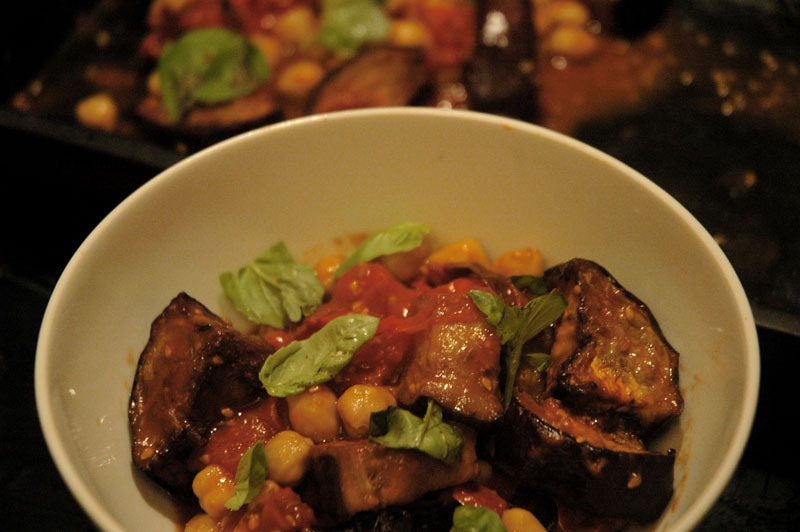 Drain the chick peas and toss them in with the roasted veg, along with the fresh basil, a glug of olive oil and a big squirt of harissa (Nige says a teaspoon for 4 people: I'd never be so meagre but then it depends how spicy you like it). Mix it all around in the juices then get munching.